If you’re looking for the simplest, most straightforward way to make money, with little effort, and in the shortest amount of time possible then you’ve landed on the right page! 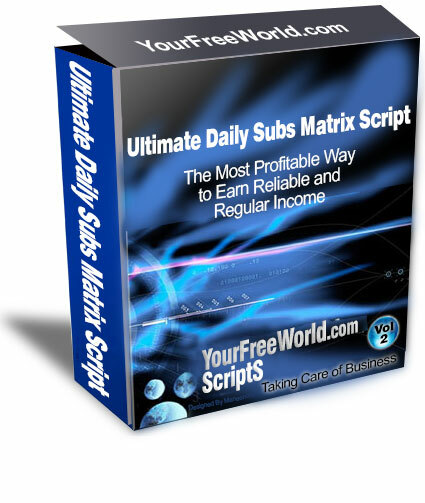 The Ultimate Daily Subscription Matrix is an automated program that allows you to run Subscription Based Matrix without any hard effort. Setup couldn't be easier... You set the one-time subscription fee and choose the matrix where you want to give position(s) to a user and whenever a subscription hit a new position is created for user after deducting amount from there subscription wallet. You'll find this an extremely versatile, powerful script -- and like all YourFreeWorld scripts, it's a snap to install and be up and running in just a few hours. Then you will find how easy it is to start generating revenue! Setup Daily/Weekly/Monthly Subscription Payment of the Platform. Tweak the Minimum Payout and Deposit Fee to Cover Transaction Charges. 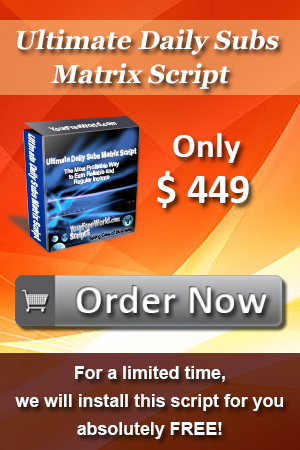 Since this Matrix Script has a Subscription option, it will last longer than other programs out there, which means more income. And of course, all the previous features (from previous versions of the Ultimate matrix program) are available in this new script. Payment Processors for USD: Payza, SolidTrustPay, PerfectMoney. Payment Processors for Bitcoin: CoinPayments (can be used for USD too). Setup Subscription duration, fee and number of positions to offer in a matrix after a particular interval. Supports 2 different wallets: Cash Wallet ( for withdrawable balance ) and Subscription Wallet ( for positions purchases ). Payment Processors for USD: Payza,SolidTrustpay,PerfectMoney and Bitcoin compatible and you can also add 5 more merchant accounts of your choice. Payza,SolidTrustpay,PerfectMoney and Bitcoin IPN for auto-approval of accounts. Payza and SolidTrustPay Masspay System to pay all the Members Earnings by Payza and SolidTrustPay at once. Payment Processors for Bitcoin: CoinPayments and you can also add 5 more merchant accounts of your choice. 2 x Banner Ads Addon: Offer x banner(s) of 468x60 and x banner(s) of 125x125 to members to be rotated throughout your website.